Sacks Menswear & Formal Wear have been recognized in the fashion industry for the past 40 years. 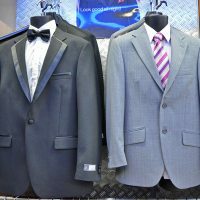 The family operated business offers an extensive, high quality range of formal wear to buy or hire for any special occasion. We can custom tailor a look for any formal event, each garment is fitted to you perfectly and alterations are available in store. We take time to understand your needs and get the look, style & colour you want. We also stock a large range of everyday clothing including jeans, shoes & accessories. Contact us via our mobile number – 0412 404 493.